I was just reviewing the written goals for a project I've started working on and after looking at a few of them, I was reminded of how important it is to make sure your goals are "SMART". For example, one of the project goals is: To create a standard framework that supports high levels of service. Hmmm... 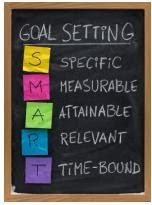 When I read that goal, I found myself thinking of the concept of SMART goals that I learned a long time ago. Somehow this goal doesn't seem to fit the SMART paradigm. Specific - The What, Why, and How. What are you going to do? What do you want to accomplish? Why is it important (reasons, purpose, benefits)? How will you accomplish the goal? Measurable - Concrete criteria for measuring progress. If you can measure properly, you can see change occur as you progress toward the goal. Ask questions like "how much?" or "how many?". Attainable - Takes enough effort to be a bit of a stretch, but not so far out of reach that is nearly impossible to complete. Relevant - "Do-able"...not "easy". The skills are available, the learning curve is not vertical and the goal is within bounds of the overall plan. Time-Bound - A clear target date or time period to work towards. Without the time element, the commitment to begin action is often too vague. I think the project goals I've been reviewing have most of the details that would cover the SMART elements elsewhere in the project docs, but I'm glad for the opportunity to review this method for stating goals. This was forwarded to me and I totally laughed out loud. I've seen a lot of flow charts (mostly of the boring technical sort), but this is my absolute all-time favorite! Zoom in on it or visit the originating site to see it better. 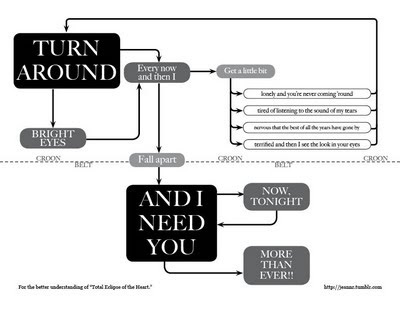 It's a flow chart of the song "Total Eclipse of the Heart". OK...what's the deal with resumes that say one thing (so that a candidate looks nearly perfect) and then you interview them and find out they can barely spell Oracle? I'd think that if your resume says you've been working with Oracle since 1988 and have worked extensively with PL/SQL, you'd know what a REF CURSOR is or maybe even know a bit about collections or something, right? I asked one candidate these questions and they said they'd never ran into those 'features'. 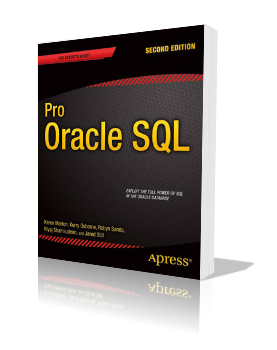 So finally, just for fun, I asked "On a scale of 1-10, with 10 being expert, where would you rank yourself in terms of your PL/SQL proficiency?" The answer: "Well, I suppose it's a bit conceited to give yourself a 10, so I'll just be humble and say 9." Personally, I think my resume is lacking overall. I seem to have a hard time distilling over 20 years of experience into a couple of pages and making the "real me" show up on paper. But, if you get me into the ballpark (i.e. an interview), I'll hit most every pitch you throw at me. But, I'd be terrified to try to over-sell myself and get caught unable to deliver the goods. So, it's just a bit scary for me to look at resumes and think "Wow!" and then talk to the person for 3 minutes and think "Yuck!" Here's hoping that the rest of this week's interviews are with folks who match their advertising. Most of us have no idea how our brain works. This has strange consequences. We try to talk on our cell phones and drive at the same time, even though it is literally impossible for our brains to multitask when it comes to paying attention. We have created high-stress office environments, even though a stressed brain is significantly less productive. Our schools are designed so that most real learning has to occur at home. This would be funny if it weren’t so harmful. 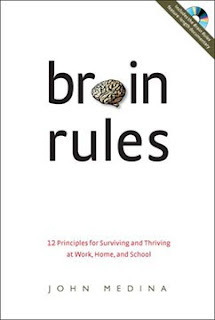 Blame it on the fact that brain scientists rarely have a conversation with teachers and business professionals, education majors and accountants, superintendents and CEOs. Unless you have the Journal of Neuroscience sitting on your coffee table, you’re out of the loop. This book is meant to get you into the loop. I've had this book for a while and recently picked it back up to re-read it. Today, this bit of the intro seemed appropriate to discuss here. Brain researchers have proven that it is (as stated above) nearly impossible for our brains to multitask. However, given the way most of us attempt to operate every day, we don't believe or accept this is true. I was thinking about how I am constantly doing what I believe to be multitasking. For example, I listen to an audiobook during my drive to and from work. Since the book is on my iPhone, I may be interrupted by a call that comes in, so I often talk on the phone while driving. When I get to work, I switch from my audiobook to a playlist of light jazz or something else with few words (I admit that I can't quite handle music with lyrics while trying to work as I always end up singing along and forget what I am doing). I work in a "cubicle village" with about a dozen of my colleagues where we each occupy about a 5x7 foot area with a half height divider wall in between. Every sound is clearly audible throughout the village so I constantly find myself vicariously sucked into other conversations and phone calls. [That's precisely the reason why I tell myself I wear earbuds so I can drown out some of the noise.] Then, at the end of the day, I switch back to my audiobook and drive home. I then started thinking about my work day. There have been several times when I'll be working on something and a song or a nearby conversation pulls my attention away from what I'm doing and I end up struggling to get back on track after a few seconds (or minutes) of distraction. In Medina's book introduction he says that we've created high-stress environments and in so doing have made ourselves less productive. I think that's true. How many of you actually have a real office...you know, one with a door and 4 real walls? How many times a day are you distracted or completely interrupted from what you're working on because of your environment? I understand the economics behind cubicles vs offices, but I think it would be fascinating to know what the real cost is in terms of lost productivity. I don't know that I'll give up my audiobook during my drive (and I may regret it one day if listening to it results in me being unable to avoid an accident), and I'm confident that I'll not rate an office with a door for a long while. But knowing that my brain can't multitask is apparently not going to stop me from trying to emulate the effect. I've been just a bit muddle-headed the past few days. I've been fighting a nasty cold with nasty symptoms. I am not reluctant to medicate to alleviate the worst of my symptoms. My mom was a public health nurse and dosed my siblings and I well whenever we got sick. So, if my nose starts to close and my throat burn, I head straight to the pharmacy and stock up. My current round of over-the-counter goodies includes DayQuil, NyQuil, and Afrin nose spray (extra moisturizing, of course). On top of that, I've already been through about 10 boxes of Puffs (plus Lotion) tissue and think I'll go through another 10 before this is over. When you wake up in the morning, after having pumped your system full of the aforementioned drugs, it's not so much that you wake up as it is that you move out of a state of total unconsciousness to one of mobile unconsciousness. It was in that state that I entered the bathroom this morning to take my shower. I think I had one eye half open (the other still felt glued shut) as I stepped into the shower. I reached down, turned on the water and... holy crap! Cold water sprayed me and I jumped back about 3 feet. Both eyes open now, I tried to squeeze between the shower wall and the cold stream to reach down and turn it off. After a few brutal seconds, I finally got the water turned off and laid my head against the wall to try and recover. I got out of the shower, reached back in, turned the water on to let it heat up and stood there on the rug, cold and dripping while I waited. This is where you say "awwwww...poor baby". I really don't think it matters that this happened while I'm fighting a cold. I'd have hated it and had the same reaction even if I'd been healthy and well. It just seemed worse this morning because I was so fuzzy-headed. Are there actually people out there who get in the shower first and THEN turn on the water? I've had a problem recently with typographical errors. I've often been guilty of using "its" when I should have used "it's", typing "teh" instead of "the" or making other errors that are spelled wrong or are grammatically incorrect. But with word processing software being what it is these days, I usually am made aware of the error and can fix it before I send an email out and get totally embarrassed. However, it is not always the case that the spelling or grammar checker catches my mistakes. Here are two recent whoppers that have served to make me a bit more conscientious. 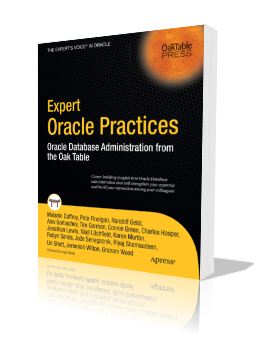 Ric: Do you know of any docs that talk to the use of Regular expressions in Oracle SQL other than the docs? Me: Jonathan Gennick wrote a small O'Reilly book on Regular Expressions. I hate it and it does a good job. Ric: Well that made me laugh this morning!! LOL!! I hope this helps clear things up. Let me know if you need any further information. Your detailed explanation was very helpful. However, I'd suggest you remember that the letters T and G are very close to each other on a keyboard. "When you’re presenting, you’ve got 10 seconds (more or less) to capture the attention of the decision-makers. If you don’t… out come the Blackberries and the iPhones, and you can basically kiss the meeting goodbye. They won’t be listening." 10 seconds...really? I've heard before that you've got between 3-7 minutes to grab your audience, but has it really gotten so bad as to drop to 10 seconds? He says that the best way to grab your audience's attention in that short time span is to quote a statistic or something "credible and factual that surprises and (probably) frightens them a little bit." I agree that you have to grab your audience from the outset. But, if we're now down to a 10 second time window, I fear we're all doomed. So, I'm not willing to buy in totally to that time estimate. What I'm willing to agree to is that you need to give your audience something worth listening to and deliver it in a way that enables them to hear the message clearly. It's about presentation skills as well as content. No matter how good your content is, it's just as much about the delivery. I also agree that today's technology allows us to exhibit ADHD behavior in a multitude of ways. From my iPhone, I can check email, send text messages, surf the web, tweet, play games, read books, and so much more. If I'm sitting in your audience and you don't keep my attention, I can easily (and, for the most part, unobtrusively) find a way to entertain myself and ignore you. I don't have to get up and leave. I simply tune you out and give my attention to my friendly, and oh so fun, iPhone. As a presenter, I hate looking out and seeing the tops of people's heads as they stare down at their mobile devices (or worse yet, their laptops). Even if 99% of the audience is staring at me in rapt attention, the other 1% disturb me beyond measure. I do understand that when you are away from the office, you aren't free from responsibility. You may still have to respond to problems if/when they arise. But, if you've booked time in your schedule to attend a presentation or conference, would it be fair to ask the folks back at the office to expect some delay in your responses? How about establishing a "check in" schedule? Maybe every 1-2 hours or whatever time frame is reasonable for your situation. Then, instead of feeling like you have to look at and respond to every call, text or email, you can just silence your little electronic friend and pick it up after the presentation is over. If you end up getting bored with the presentation and don't feel like it's worth your time, get up and leave. Hmmm...now wouldn't that be a novel approach? In the end, I do think that a 10 second "grab 'em or lose 'em" time frame is too short. But, I think the time to capture and hold your audience's attention is short in proportion to the amount of time a person is willing to limit their access to every imaginable distraction that is available at their finger tips. Maybe in the end, it's not just the presenter's job to capture the audience's attention. Maybe it's also the job of the audience to limit the distractions they will allow themselves and to give the speaker their full attention. Like the old song says "it takes two baby, it takes two". 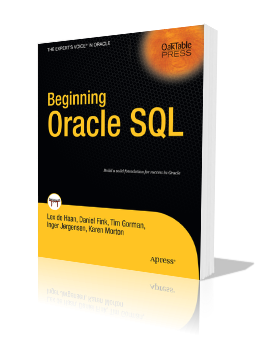 I was looking at the Oracle 11gR2 New Features guide and came across the new LISTAGG analytic function. Oh boy, oh boy! I've used Tom Kyte's stragg function for ages to do string concatenation of multiple row values. I'm way happy that that function is now "built in". After I read it in the NF guide, I Googled and found lots more folks talking about it. Cool stuff! No telling what else I'll find...better keep reading!